Project obstacles and solutions: America Place at River Ridge is an 86 acre industrial park located between Jeffersonville and Charlestown, Indiana. It is situated in the quickly expanding River Ridge Commerce Center, which is growing due, in part, to the construction of I-265 and the East End Bridge in Louisville. As the demand for warehouse and industrial space is growing in the River Ridge area, developers are looking for ways to speed up construction of large spec buildings. In particular, any delays in building materials comes as a detriment to progress. America Place Building III is a 200,000 square foot building that used tilt-up walls to speed up the construction process. AML was the contractor for this project and they have perfected speedy construction using tilt-up concrete walls. 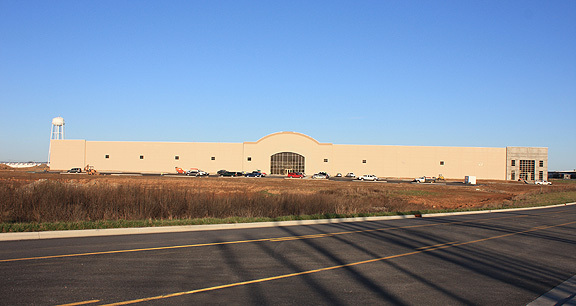 Traditionally, precast concrete walls have been considered for large warehouse construction. The disadvantage is one of time and flexibility. Tilt-up concrete walls are built on site and do not have to be ordered, manufactured and shipped to the construction site. Lead time on precast walls can be as great as 9 months. Change orders on tilt-up walls can be adjusted without interrupting the construction schedule. AML has used this process to meet the speed of construction demands. IMI supplied 6,000 yards of a 4,000 psi concrete mix that was designed specifically for early strength and a smooth finish. The mix allowed the walls to be poured, lifted and set into place within seven days. This helped AML to stay on schedule and complete the building on time. For more information on tilt-up concrete walls, contact the sales representative for the plant nearest your location. Click here.